HOT WATER TANKS – Glenn Richardson Plumbing & Heating Ltd. Hot water tanks, otherwise known as water heaters, vary significantly in sizing to cover a range of demands on the tank. Prior to a hot water tank installation reviewing the demands on the tank will ensure hot water consumption is not an issue. Not having enough hot water for an office is an annoyance but for a manufacturing facility this could cause interruptions to production. With a hot water tank replacement the demands on the tank should be re-evaluated to confirm the size of the hot water tank is still appropriate. The piping connections for a hot water tank should also be checked to ensure everything is in good condition. In the case of a gas hot water tank the venting should also be checked. 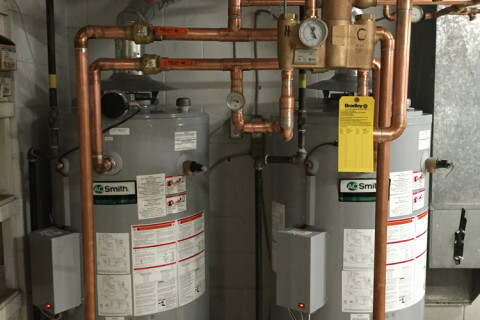 Mixing valves are required on all hot water tanks to ensure that water temperatures remain between optimal temperatures as laid out by the Ontario Building Code. If the temperature is too low there is the potential for legionella bacteria to develop and if it’s too high there is a risk of scalding accidents. A mixing valve is installed with new hot water tank installations. In the case of a hot water tank replacement the mixing valve is checked to ensure it’s working properly and is repaired or replaced as needed. When issues occur with fluctuating water temperatures or lower than normal temperatures a mixing valve repair is generally required. In the event the mixing valve isn’t repairable then the mixing valve will need to be replaced. 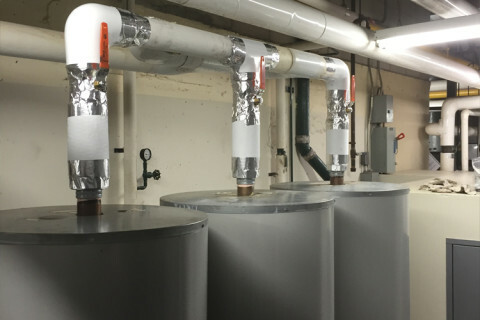 Low water temperature is a serious concern for hot water tanks as bacteria can start to grow in an environment where the water temperature is below 125 degrees. Any tank that has been sitting below this temperature should be drained and refilled to ensure the water is safe for use. Hot water return pumps are extremely helpful for commercial properties where hot water isn’t used on a consistent basis. When hot water is left to sit in the pipes for an extended period of time in between use it goes cold. The water needs to be run for a period of time before hot water reaches the faucet which results in more water waste. A hot water return pump consistently provides warm water in these low use situations. A hot water return pump also helps prevent water from sitting still in the pipes and creating an environment where bacteria can grow. 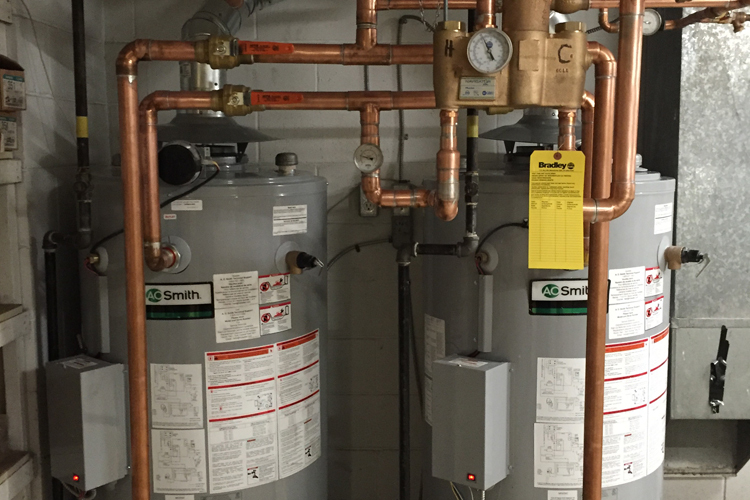 Hydronic heating systems circulate hot water through piping to create heat. Hydronic heating is generally a more energy efficient heating system when compared to more traditional heating systems. By providing a steadier heat source hydronic heating is more efficient for manufacturing and warehouse facilities with higher ceilings and more open space. In facilities where a high demand of hot water is required it is generally recommended there be a domestic hot water boiler along with the hot water tank. Along with the two a storage tank installation would be required. With the storage tank there is much more water kept hot to keep up with the high demand. Like hot water tanks when storage tanks start to leak a storage tank replacement will be required. With storage tank repairs the only part that can be repaired is the anode, there are few parts to the storage tank.